If your pup ever gets lost or runs away, you would do anything to get him back. 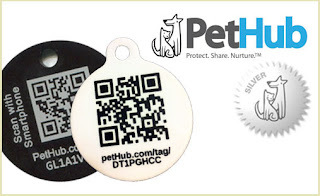 Get peace of mind and security with a scannable Link ID Tag from the leader in online pet data and security--PetHub. Store your pet's information online for free. Each tag can be scanned with an iPhone, Android or any other smartphone to display your pet's information online. PLUS get a one-year PetHub Silver Subscription.